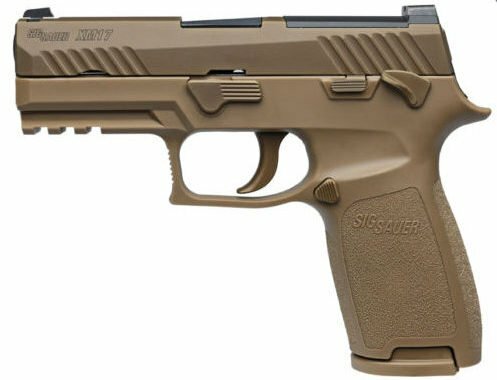 Sig Sauer P320 is Army's New Handgun! You are here: Home / Firearms / Sig Sauer P320 is Army’s New Handgun! 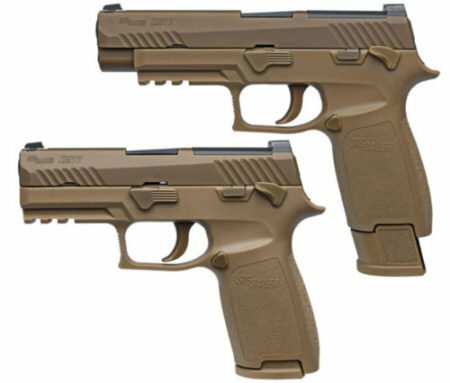 Sig Sauer P320 is Army’s New Handgun! The U.S. Army’s new handgun: Sig Sauer XM17 (photo from Sig Sauer). It’s official: Modular Handgun System (MHS) contract with a slightly modified P320 Carry pistol. This pistol contract is absolutely huge! Sig Sauer will earn up to a little over $580 million over the next 10 years to produce around 1.9 million pistols, with spare parts for the Army. That means the Army is getting a steal of a deal as each pistol will only cost around $300.00 instead of the MSRP of around $600.00. The new Sig Sauer XM17 will replace the venerable Beretta M9 after over 30 years of service. The name of the new Army pistol has not officially been announced, but will likely drop the “X” (or trial indicator) to become the M17. The decision made its rounds in the Media Room at SHOT Show on January 19, 2017, and despite the significance of the award the Sig Sauer representatives were hush-hush about the details. 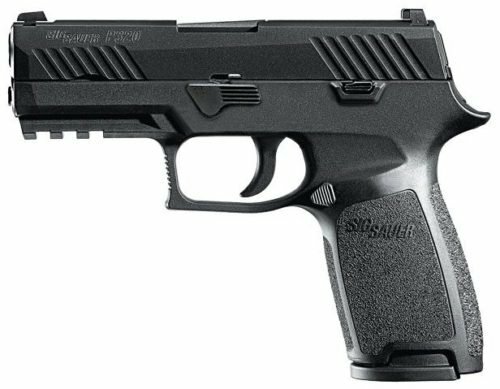 Sig Sauer did finally provide a press release on January 20th praising the P320 and expressing their obvious excitement at being awarded the contract. Before I posted the announcement I wanted to see if Sig Sauer was releasing pictures of the winning entry, and they finally have. The slightly modified Sig P320/XM17 Carry model is the new Army handgun (photo by Sig Sauer). In winning the Army’s MHS contract, Sig Sauer beat out Glock, Beretta, FN America, and several others along the way. Smith & Wesson, STI, and a few others were eliminated early on during the MHS competition, that was widely criticized for its excessively long duration and cost. The award going to Sig Sauer is no small feat. All of the companies in the final running have had significant success in previous military contracts and overall. Sig Sauer cemented their front running P320 with a promise to manufacture and distribute all of the Army’s new pistols from their New Hampshire factory. American made pistols in America’s Army’s hands sounds much better than pistols from a foreign land. Sig Sauer has been in the United States since 1985, and in their New Hampshire location since 1990. According to CEO Ron Cohen, Sig Sauer was on the ropes in 2004, but the addition of AR-15 style rifles turned the company around. Thankfully so, as Sig Sauer has produced some amazing firearms since then. Sig Sauer is no stranger to military contracts either, even within the United States. For years, U.S. Navy SEALs were issued the excellent Sig P226 for missions, and other special operations forces had access to them as well. Anyone who has fired a Sig Sauer knows they have shot a quality firearm. A standard Sig Sauer P320 Carry model with black frame and slide (Sig Sauer). 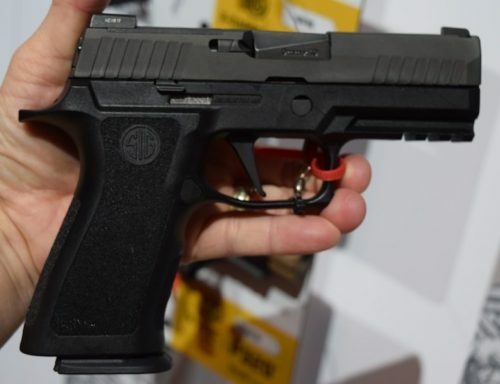 Sig Sauer had already designed the P320 to be modular. In that, the pistol’s frame is capable of interchanging calibers by simply swapping slides, barrels, and magazines. This is incredibly important for a military contract where mission-specific needs or desires may dictate different calibers. The P320 Carry is the upper middle-sized pistol in the P320 series. Having a reduced overall size is very important in reducing weight and size signature. Despite the smaller size, the Sig Sauer P320 (XM17) still packs an amazing 17+1 capacity in 9mm – the cartridge that will be the primary issued U.S. Army pistol round. A standard Sig Sauer P320 Carry at SHOT 2017. The Army’s XM17 will have all Flat Dark Earth (FDE) controls and magazines, as opposed to the standard P320 FDE versions that have some black controls and magazines. In addition, the Army’s XM17 will offer a full-sized slide option without changing the P320 Carry frame. 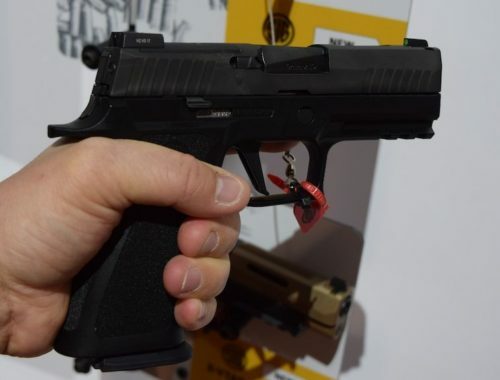 In essence, a longer slide can be substituted on the slightly smaller frame of the P320 Carry. 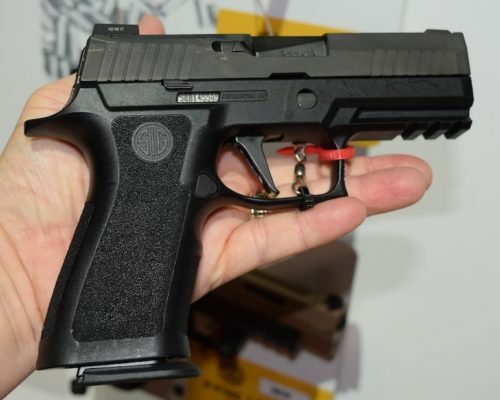 There is still some mystery to the Sig Sauer Army pistol as the pictures Sig provided show the Carry model frame, while some literature says they will offer a “Full Size” and “Compact” version. This could simply be semantics with the Carry version being offered in standard and long-slide versions. In addition to the larger slide option, the Army Sig Sauer XM17 will offer an extended magazine as well. The pictures from Sig Sauer show this option with the longer slide option, but I’m sure the magazines could be used in either model. Another interesting difference between the new Sig Sauer XM17 and standard P320 Carry FDE pistols is the existence of a black strip on the top of the slide. Another look at the standard Sig Sauer P320 Carry. The P320 Carry provides the shooter a smooth, crisp trigger that assists with accurate, and intuitive shooting. The P320 Carry 3-point takedown process makes field disassembly, cleaning, and maintenance very easy. The Sig Sauer P320 Carry offers a full-length grip, compact slide, and choice of contrast or SIGLITE Night Sights. In addition, the Sig P320 Carry can accept 9mm, .357SIG, 40S&W and .45ACP calibers. Safety features include a striker safety, disconnect safety and optional manual safety. The new XM17 pistol will offer (3) M1913 Picatinny rail attachment points for lights, lasers, or other accessories. Rear Sight: U-notch 2-dot or SIGLITE night sights. Holding the Sig Sauer P320 Carry was very comfortable and natural. The selection of the Sig Sauer P320 for the U.S. Army’s Modular Handgun System (MHS) is not without controversy. The P320 has only been on the market for a little over two years, so many firearm enthusiasts claim the pistol has not proved itself in a baptism of fire, so to speak. On the other hand, Sig Sauer has proven itself multiple times over with outstanding quality firearms that are considered among the top of the line. Though I have written positive comments about the Special Operations Command selecting the Glock 19 as their primary pistol selection, I am actually quite pleased with the Army’s selection. Sig Sauer has earned a reputation for outstanding quality, accuracy, and durable firearms. The modular option Sig Sauer provided in size and caliber is a very nice match for modern U.S. Army needs. In addition, I am very excited to see the U.S. Army and Special Operations Command switch from traditional all-steel hammer-fired pistols, to modern polymer-framed striker-fired pistols. Special Operations Command has selected the Glock 19 for SEALs, Rangers, and Marine SPECOPS, while standard Army troops will be issued the slightly modified Sig Sauer P320 Carry. All in all I think this selection is a big win. Special Operations gets a hardy, simplistic, and durable pistol in the Glock 19 with no external safeties, while regular U.S. Army troops get an amazing striker-fired option Sig Sauer with a manual safety. Though the Army did not ultimately choose to tag on to the Special Operations contract for the Glock 19, the selection of the Sig Sauer P320 Carry (XM17) continues the tradition of competition that fuels advancement for tomorrow’s soldier! To be honest, I’ve never been enamored by striker fired guns. I have owned many, but I find myself sticking to things with a hammer. I cut my teeth on the 1911, and that sort of spoiled me. As far as the selection goes, I believe the price was just too hard to turn down. Maintaining and upgrading the M9s in inventory would probably have cost far more than buying the Sig for a bit more than 200 bucks each. As for the P320, which has a sort of ancestor in the p250 (now being discontinued) I don’t believe either guns are particularly good. If you do a little searching you will find that the p250 caused just about anybody who adopted it a load of problems. The P320s I have worked with /handled/ worked on were quite underwhelming to say the least. Had any pistol been on the table as an option, my pick would be the HK P30 with the LEM trigger setup. In my opinion it is easily one of the best polymer offerings out there, however they retail for about 1000 dollars (not sure what .gov pricing would be) HK didn’t even participate this time, and i feel that it was a wise business move. Every time this whole pistol replacement program came up, all the big companies made bids with good products, but each time it was a big waste of time. It was like the government just wanted to window shop. You had a special Glock 21 with a 1913 rail and ambi mag release (used to have one, sort of regret selling it). The HK 45 came about as another offering when, at that time, the military wanted to go back to a .45 because 9mm didn’t have the “stopping power”. This saga isn’t over, it will be challenged I think. Also when the guns are delivered (if at all, ill believe it when I see it) I predict there will be quality and reliability issues. I guess we will just have to wait and see. You make some very valid observations. Though Sig Sauer has a strong reputation for high quality firearms, the P320 is still relatively new. This can lead many to wonder what its reliability will be over 1000’s of rounds and hundreds of thousands of pistols. However, for now I’m banking on Sig delivering as bid. Glock started from scratch to compete for the Austrian Army bid, and we can see how successful they’ve been. The 1911 has proven itself for over 100 years, and is a fine pistol. Yet the pistol is limited in capacity, is much heavier then the polymer competition, and is more difficult in field stripping. One could also say standard sights are much more lacking. The new striker fired pistols usually break down into (4) pieces: slide, barrel, captured recoil spring assembly, and frame. This makes them very easy to clean, maintain, inspect, and put back together in the field. In addition, modern warfare has seen a lot more house to house, room to room battle. Not to mention the polymer leaves less area requiring oil If a rifle goes down, or space is too limited to maneuver with the long gun up, a pistol with higher capacity could make the difference (with the king being shot placement of course). I agree with many of your points. I do hope things work out and they don’t encounter any problems with the Sig. I have one of their P229 Legion pistols that I like pretty well. Having more ammo certainly is not a bad thing. My take on a handgun is that is basically a personal self defense tool and not much else. If we know we are heading to a fight we will have our rifle or shotgun right? Unless we have a Mark 23, because it’s an “offensive” weapon 😉 I keep a Noveske 10.5″ AR with a Surefire can in the car, but the only tool we may be pretty much guaranteed to have with us at any point on duty will be the handgun/s we carry. I believe this simple fact has driven a favoritism toward pushing the role of a handgun to nearly that of the concept of a PDW, emphasis put heavily on capacity as a force multiplier. If a handgun is not the primary weapon that we have to work with, I don’t think capacity is such an issue. SWAT and specialized roles would be an example, the primary weapon is going to be a long gun and truly the handgun would serve as a secondary tool. I know at least a couple SWAT guys who carry high end 1911s because of the confidence they have in their ability to shoot with extreme precision should they need to take a headshot or some such scenario. One of the guys is a Marine (this is my surprised face) and is convinced the 1911 is the best CQB fighting handgun ever created. I love 1911s I own two Wilson Combats and I wouldn’t trade them for anything (ok, might trade for an Atchisson AA-12) The longslide .45 is an occasional carry but mostly a range toy. I actually use the small 9mm sentinel as a backup, but as primary I carry an HK P30L with the LEM trigger setup tuned up by Bruce Gray. I carry three spare mags and use the extended basepads by Taylor Freelance. Meaning, I carry a total of 76 rounds, I believe in carrying as much as you can. My colleagues give me crap for being a bit of a ninja. The 1911 requires a much more dialed in end user, the average officer doesn’t want to muck with them, understandably. I think the 1911 will continue to serve the truly committed and professional folks but most are vastly better of with something else, probably something in polymer. They should have went to the Glock but I understand why they didn’t. Soldiers would be having accidents while breaking it down because of having to squeeze the trigger, (that’s a shame!) and another reason is the safety features and because it’s modular even though you can interchange the Glock from 9mm to .40 cal but that is not advertised. Glock has already proven itself and most LEA’s use them, but time will tell with the P320. In your bottom 4 images of the article, they are not actually photos of the “standard” P320 Carry. Those are actually photos of the brand-new, yet-to-be-shipped X-Carry. Basically the same gun, but an improved straight trigger, slide lightening cut, and different grip module/frame. Excellent catch Riley. I found the X-Carry pictures were grouped with standard P320 Carry pictures from SHOT Show and accidentally included them. 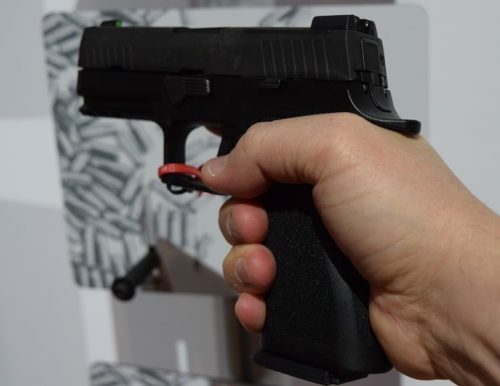 I have read that the Sig Sauer P320 didn’t pass the ‘drop test.’ Is there any validity to this? A police officer claimed he dropped his Sig, it went off, and shot him in the leg. Also that Dallas officers will cease using this weapon until this problem is fixed. There are videos up at YouTube showing just a hard knock to the gun can make it fire. Have you heard about this issue? I have many family members in the Army and would like reassurance from a trust worthy source, YOU, this isn’t the case. It seems that the SIG P320 can discharge if dropped in just the right way. The police officer wounded by a P320 that discharged when dropped filed a lawsuit, though the outcome of that suit has not been determined at this time: http://www.news12.com/story/36095322/officer-injured-by-dropped-holstered-gun-sues-gunmaker It could be determined that SIG was not negligent in any way. Though there are several internet videos showing Sig P320’s firing when hit with a mallet, there are very few documented cases of the Sig P320 discharging during actual drop tests. The Army most definitely put it through their rigorous processes before it was selected. Now, can the P320 discharge if dropped in just the right way (a very rare angle)? It does appear this can happen. However, like Richard points out, Sig has issued a “voluntary upgrade” to eliminate this possibility and it is free. Also, the Dallas PD did temporarily suspend issue and carry of the P320, but has since approved the P320 for duty use. will Navy Seal accept p320 carry, since they have been issued G19 as their new official handgun!? It is very likely the Sig Sauer P320 will be among the approved firearms for the SEAL Teams.